Standing undefeated and No. 1 in the nation, Alabama hopes to continue their winning ways against an Arkansas team trying to stay in contention in the brutal SEC West. Despite the fact that it has struggled with turnovers, the Tide's offense has been terrific, never scoring less than 34 points, which was this past week against Kentucky. Even though he is extremely young, true freshman Jalen Hurts continues to improve, under the leadership of offensive coordinator Lane Kiffin. It also helps that he has receivers Calvin Ridley, Gehrig Dieter and ArDarius Stewart to work with on the outside, which should give Arkansas plenty of issues on the perimeter. Alabama can also use their physicality, which begins with their massive offensive line and running backs Damien Harris and Bo Scarbrough. Arkansas has a massive front seven that can counter, but you wonder if they have the depth and stamina to contain that Tide ground game for four quarters. 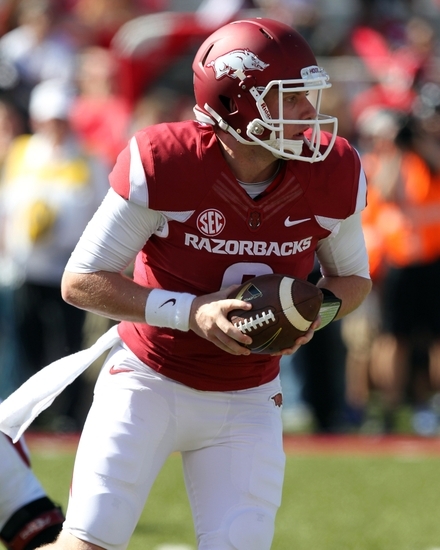 The Razorbacks will do much the same on their side of the ball, running beyond a bulky O-Line and playing smart through the air. Rawleigh Williams III (559 yards, four touchdowns) has been a beast so far this season, while youthful Devwah Whaley adds an interesting change of pace. Quarterback Austin Allen will hope for a big showing as he squares off against an Alabama defensive backfield stocked with future NFL prospects. Versatile Eddie Jackson is great in coverage and will help the Tide out in stopping Arkansas' top receivers, Drew Morgan and Keon Hatcher. Corner Marlon Humphrey and Minkah Fitzpatrick will also contain the Razorbacks through the air. Arkansas has given 'Bama plenty of issues through the past few years and plays a similar brand of football, smash-mouth and physical. However, the Razorbacks don't have the speed on the outside and playmakers to upset the Tide, even at home. While Alabama may be the team to beat in the SEC West, Texas A&M hopes they can keep pace with the Tide with a win over Tennessee. In order to do that, the undefeated Aggies must find a way to stop a Volunteers' squad that knows how to work some serious magic. Despite being down at some point in nearly every game they've played, the Vols are 5-0, with a ton of momentum after taking down Georgia in a thriller this past weekend. Texas A&M has been moving the ball with plenty of success, but in a different way than normal. Instead of their typical pass-happy offense, the Aggies have looked to the ground for most of their success, as Trayveon Williams has 487 yards on the ground so far this season. However, the aerial attack should have some success, led by Oklahoma transfer Trevor Knight at QB. Knight won't burn the defense much, but he doesn't make mistakes, which is critical, considering ball-hawking corner Cam Sutton is lurking in the secondary for Tennessee. The Vols' offense has been inconsistent throughout much of the season, but has been able to find its rhythm in the second halves of games. Senior quarterback Joshua Dobbs is very dangerous with his legs, but will need to make some big throws in this one to stretch the athletic Texas A&M defense. Jalen Hurd and Alvin Kamara give the Volunteers two big backs to give the ball off to and attack A&M with their power, but Hurd is questionable for this matchup. Tennessee will also have to protect their quarterback as they are squaring off against one of the nation's best pass rushers in junior Myles Garrett, who teams have struggled to neutralize even against constant double teams. The Aggies do know one thing for sure; even if they get up big in this one, they know they can't take their foot off the gas pedal and allow the Vols back into the game. Tennessee will have to also show they can handle the hostile Kyle Field, a brutal road environment. They've won in some tough road meetings already so far this year, but Kyle Field may be the toughest. The Volunteers have won some absolutely magical games so far this year, but the magic has to run out sometime. The Aggies are incredibly balanced and know how to stop big plays, and they should be able to get the job done. In the latest edition of the Red River rivalry, both schools are hoping to turn around what have been disappointing years. A popular preseason Playoff pick, Oklahoma has lost to Houston and Ohio State, while the Longhorns have really struggled since a season-opening thrilling victory over Notre Dame. In the midst of two straight losses, the Longhorns have struggled to stop anybody, and have demoted defensive coordinator Vance Bedford while questions about Charlie Strong's future as head coach continue to swirl. A struggling defense is exactly what the Sooners were hoping for. While the offense has had some issues at times, it still has a wonderful, big-armed quarterback in Baker Mayfield and two great backs in Samaje Perine and Joe Mixon. Perine and Mixon are infamous for running through arm tackles, which is worrying for a poor-tacking Texas defense. Mayfield should also give that defense struggles with his huge arm, considering the Longhorns' secondary is also struggling mightily. Texas is hoping to find some stability in their offense, which has proven it can move the ball but also has some consistency issues. That is bound to happen with a true freshman at QB, Shane Buechele. Buechele will need help from D'Onta Foreman and Chris Warren III, who are powerful rushers that are fantastic when healthy. Combine that with hard-running signal-caller Tyrone Swoopes, and the Longhorns have proven that they can move the ball in a variety of ways under first-year offensive coordinator Sterlin Gilbert. That offense will hope to have some success against the Sooners solid defense. That defense is led by a tough front seven, headed by Charles Walker and a secondary that is starting to find itself after some early issues, namely Jordan Thomas at cornerback. No matter which team is playing better, rivalry games always seem to be close because of the energy and passion involved. While neither team is playing great, Oklahoma does seem to be playing better and have more momentum. They also should be able to capitalize on Texas' weaknesses and finish the job.